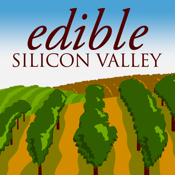 Edible Silicon Valley is your must-have guide to eating and drinking local in San Mateo and Santa Clara counties. Our region is a mecca of community, rich agriculture, innovation and sustainability and ESV is here to tell these stories. Readers are served an engaging and intellectual feast about what’s in season, where to find it, the people who provide it and the connections between quality food and good health. Along with rare access to the most influential farming, food, drink, artisanal and nutritional experts, the magazine provokes thought (and hunger) with an authentic, visual and enriching culinary experience.